Track Budget is an easy to use Windows 8 budget tracking app. It will be a nice idea to make it clear that this Windows 8 app is not about planning your budget; instead it lets you make quick comparisons between the expenses, earnings, and your estimates. The idea behind the application is to evaluate the current status i.e. whether you are spending as per budget or over-spending. 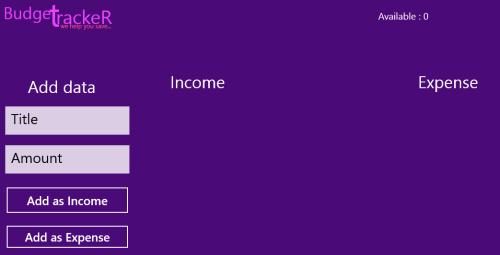 On launching this Windows 8 budget tracking app you will be presented the following interface in front of you. The interface includes two text boxes for entering the details of income or expenditure. 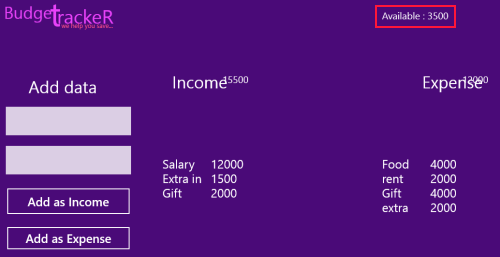 Below it, are the two buttons stating ‘Add as Income’ or ‘Add as Expenditure’. Have a look on the points stated below. It must be noted that Track Budget Windows 8 app does not delivers you any type of storage. It will be a nice idea to begin when you have some time to spare. Type particulars in the text-box above. Then, enter the amount in the text-box beneath it. Next, depending upon its nature, click on ‘Add as Income’ button or on ‘Add as Expense’. On doing so, the entry will be included under the proper heading to the right. The above procedure is to be repeated for entering the expenditures and incomes. Once you are done with feeding income and expenditures; you will come to know about the real status. On the top right you will be presented the amount left with you. lucky! are those with a positive figure. Also, check out our posts on Expense Tracker Apps, Password Generator Apps, and IQ Test Apps. For Installing Track Budget Windows 8 budget tracking app you will require opening this link in IE 10 or advance. Upon being redirected to add overview window click on ‘Install’ button. * Track Budget is only 489 KB in size and does not requires any extra permissions. Track Budget is a very straightforward apps and might suit the requirements of many. Consider giving it a try and evaluate by yourself. If you are thinking that Track Budget to very simple, then you are right. It is a simple, yet a useful application.